Editor’s Note: One month after our first Alumni TIES in Zagreb, we received news that a TIES participant would be given one of the U.S. Department of State’s highest honors. 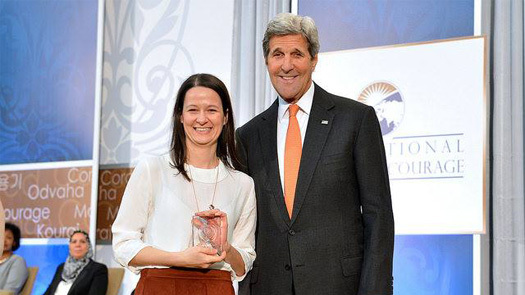 Zuzana Števulová (pictured with Secretary Kerry on the right) is one of fourteen 2016 recipients of the U.S. Department of State’s International Women of Courage (IWOC) award. Secretary of State John Kerry presented the awards in a ceremony in Washington D.C. on March 29, 2016. We are incredibly proud of Zuzana’s achievements and her work in the field of refugee and migration issues! This recognition also speaks to the caliber of the phenomenal alumni who attended our first Alumni TIES in Croatia. We look forward to warmly welcoming the new IWOC alumnae into the exchange alumni community. The inaugural Alumni Thematic International Exchange Seminar (Alumni TIES) took place in Zagreb, Croatia February 22–26, 2016. The first of up to eight regional alumni seminars sponsored by the U.S. State Department’s Bureau of Educational and Cultural Affairs, the event convened 40 U.S. government-sponsored exchange program alumni from nearly 30 countries across Europe and Eurasia to share insights on refugee and migration policy and practice. The seminar harnessed the collective knowledge, experience, and ideas of alumni and provided a space for collaboration on projects that will address the challenges related to the unprecedented flow of refugees and migrants in Europe. Nominated by the U.S. embassy in their country, the participating alumni represented a wide range of backgrounds and sectors, including EU organizations, local governments, NGOs, international organizations, and private enterprise. They brought expertise in a wide range of topics including asylum policy, resettlement and integration, advocacy, women’s and children’s rights, human trafficking, health, education, and more. Through various sessions with refugee policy specialists, panel discussions, breakout groups, and a local site visit, alumni shared challenges and best practices in assisting refugee and migrant communities and in promoting diversity and integration in European communities. They also participated in trainings on project design, implementation, and evaluation in order to enhance their project management skills. The group even played a role in launching the Alumni Action Corps, an initiative which will allow alumni around the world to lend their skills to volunteer initiatives where they matter most. Finally, Alumni TIES participants have the opportunity to seek support for their project initiatives and apply for up to $10,000 in small grants. While many topics were explored throughout the seminar, one of the overarching conclusions expressed by the participants is the need to resist addressing the current situation unfolding in Europe as a “crisis,” a term which Slovakian participant and IVLP alumna Zuzana Števulová argues puts unfair blame on the refugees themselves. “Migration itself is not a crime,” she explains, “and it should be underscored that these individuals are fleeing their countries due to war or failed political processes.” As repeated by multiple participants throughout the course of the seminar, greater emphasis must be placed on seeing the refugees as human beings deserving of basic human rights. Alumni TIES brings together exchange program alumni from regions around the world to discuss a topic of critical importance. Future Alumni TIES programs in 2016 will take place in Nairobi, Kenya for alumni of the Young African Leaders Initiative (YALI) on the topic of judicial reform, and in in Bangkok, Thailand for alumni of the Young Southeast Asian Leaders Initiative (YSEALI) on project management and community organizing.